Every kindergartener already knows all these things. Especially kindergarteners who have been given lots of free play time exploring objects hands-on. They know that they can either push or pull their friends on a wagon. They know that the faster they pull, the faster the wagon goes. They know that when they crash one toy car into another, it shoves the car out of the way. They know that if they want to swing really high, their parent needs to give lots of big strong pushes. They know that they can try to slow down their dog by pulling back on the leash. They know they can close a door gently or push it hard and fast so it slams closed. They know that how well something moves after a push depends on its size, shape, and weight. They have plenty of hands-on experience with these ideas. When we “teach” these ideas, we’re just giving them vocabulary, and helping them to notice and define what they already know. The way I structure a science lesson is to first have “discovery time”. I put out multiple activities that allow them to experience the science first. Then I do the formal teaching of the concept and vocabulary. Then, I offer “tinkering time” where they get to explore the idea again, reinforcing the theory they’ve just been taught with the concrete hands-on experience that helps them to understand it and remember it. We have taught Force as part of our Simple Machines unit, and we have also taught it in conjunction with Gravity and Magnets. Here are a collection of ideas for teaching Force. Attach a string / rope to items and let children pull them around a room. Even better, give them a rope to try tying on to things and seeing what all they can pull. 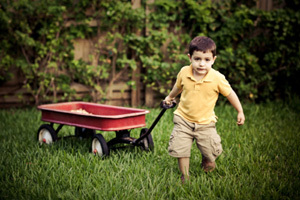 Put out items kids can push – the bigger the better – small kids love moving big things. Sit in a circle. Have one child push a ball to another child. They stop it, then push it to someone else. Play soccer or any other ball game that’s about “pushing” the ball to each other, stopping it, and pushing it back. Play tug of war. First have one side pull while others do not – what happens? Then have both sides pull gently, then both sides pull hard, and so on. Play tether ball, pushing the ball back and forth. Take three opaque containers with lids. Fill one with rocks, one with dry beans or pasta, and one with cotton balls. Have children push them around – which takes the most force (hardest push) to move? Use pipettes or eye droppers to pull liquid in, then push it out. Blow through straws at a ping pong ball or pompoms. Blow softly and blow hard – which moves the ball more? Bowling: set up pins and give them a ball to knock them over. (You don’t need an official bowling pin set – toilet paper roll bowling works just fine.) For a fun bowling variation, try pendulum bowling. Or create a wrecking ball to knock over towers. Scooters: if you have those little Scooter Boards, then have kids pull each other around the room, then push each other, then have two kids sit on scooters right next to each other and push each other. See it: www.youtube.com/watch?v=0ZuYUCdWT_s. You could also have kids bring their wheeled ride-upons from home: bikes, trikes, scooters, etc. They move their friends around. Friends need to describe whether they are being pulled or pushed. Have pushing races. Have four types of objects and a track with distances marked (could just be a flattened cardboard box with distances marked on it. They can test each of the objects: if they push gently, how far does it travel? What if they push hard? Which object travels the farthest? Offer a worksheet where children can describe whether the illustration shows someone pushing or pulling. Note: although this standard explicitly says that “assessment does not include non-contact pushes or pulls such as those produced by magnets”, when we teach Force in our magnets class, we do demonstrate and play with these non-contact pushes and pulls. Children as young as 3 are easily able to grasp the idea of pushing and pulling with magnets. For K-PS2-2: Analyze data to determine if a design solution works as intended to change the speed or direction of an object with a push or a pull. Use a marble maze toy or a ball wall where kids line up pipes and tracks just right to give the ball a path through the maze. Use a cardboard box lid, craft sticks and a glue gun to make marble mazes where kids tilt the box lid back and forth. As gravity pushes the ball, the sticks change its direction of motion. Set up a ramp to roll balls down. At the bottom of the ramp, place various objects – see if the stop or re-direct the ball’s motion when it hit. Directions here. Set up domino chains and knock them down or create other Rube Goldbergs. Use catapults – push on one end to launch items in the air. Note: although the standard says “assessment does not include friction as a mechanism for change in speed”, we do end up discussing friction during our Simple Machines unit. We cover it when talking about Wheels and Axles. Our 3-4 years olds experience friction but can’t articulate an understanding of it, but our 5 year olds certainly can. If you’re teaching force as part of a simple machines unit, you want to convey that all simple machines transfer force. They may change the direction and/or the strength of the force. Most simple machines make things easier by allowing you to use less force to do the same amount of work. There’s a lot you could do with learning the vocabulary of positions and direction of movement: play games where you ask kids to go behind, above, into, and so on; read books and ask them to describe the positions in the pictures; play Simon Says – “run away from the wall,” “run toward the swings”, “run around the tree.” Give each child a toy, and have them place it in front of them, then behind them, above, etc. Shake the shaker above your head, behind your back, and so on. Challenge kids to push a wide variety of objects, including some they will not be able to push – a desk that is too heavy for them to move, or a tree that is rooted to the ground. Ask them to make observations about why it won’t move. Set a block on the ground in front of you: ask – “can I move it with my mind?” (they all shout no). “Can I move it by just telling it to move?” (No) “How do I move it?” (Use your hand.) Set your hand on it, but don’t push. “How come it’s not moving?” (You have to push it!) “Now it’s too far away from me – how do I get it back?” (Pull it!) Now I want to push it to [name a child]. How do I do that?” (Push it!) Push it gently. “It didn’t go far enough. What do I do?” (Push it harder.) Push it to the child, and have them push it back. Then ask them “What if it’s really icky, and I want to move it, but I don’t want to touch it?” Talk them through helping you find a stick to push it with, or another solution. Ask what the difference is between push and pull – push moves an object away from you (where the force is being exerted) and pull brings it toward you. Try this Push and Pull song to the tune of Row Your Boat… it starts Push, push, push your cart, gently through the store. Fill it full with lots of things, then let’s add some more. And Everyone Shouted, “Pull!” by Claire Llewellyn. Described as a ‘first look at forces and motion’, this is a great read-aloud for ages 3 to 5. It engages them in the story of animals trying to get items to market, and loading up and pulling the wagon. Move It! : Motion, Forces and You by Mason. Age 4 – 7. On a page, it describes a concept and the illustration shows examples and asks children to notice things about the illustrations: “You use force to move your body… you also use force to move things… Can you find five ways these children are using force to move their bodies or other things? There are also instructions for five hands-on experiments, and more ideas listed in the back for parents and teachers to explore with the children. Give It a Push! Give It a Pull! : A Look at Forces by Boothroyd. For ages 4 – 6. The text is quite good – the graphic design a little cluttery. The big picture ideas it addresses are: A force is a push or a pull. Sometimes the cause of a force is invisible [wind, gravity, magnets] . Forces put things in motion. Stronger forces can make things move farther or faster. Friction is a force that slows things down. Force can change the shape of things. We have also used Forces Make Things Move by Bradley and Motion: Push and Pull, Fast and Slow (Amazing Science) by Stille. If you’re teaching older kids about force, inertia, Newton’s laws of motion, there’s lots of great activity ideas in this lesson plan from Lakeshore.